10. 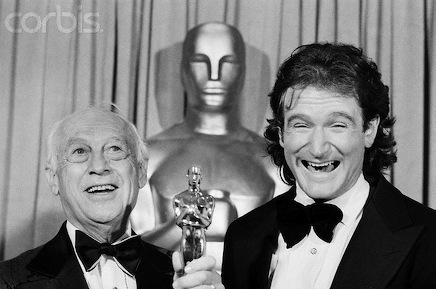 Future Oscar-winner (Good Will Hunting) and box office champ (Mrs. Doubtfire) Robin Williams is introduced as "America's newest comedy sensation" by host Johnny Carson. He's also the night's first presenter, handing an honorary Oscar to animator Walter Lantz for "doing strange and wonderful things with a laughing bird," namely Woody Woodpecker. 9. It wasn't supposed to be this way, but beauteous Natalie Wood makes her last Oscar appearance, with Yul Brynner, to help present the award for best foreign film. She dies in 1981, at age 43, in what remains a mysterious boating accident. 8. Sammy Davis Jr. and Steve Lawrence perform an extended medley of movie songs that went unheralded by voters during the previous 51 Oscar ceremonies. They initially try to soften the blow by singing in tandem: "Not even nominated, makes you feel about that tall. But just remember Oscar's only human after all." Still, it's shocking to hear them perform "Singing in the Rain" as one of the many songs never nominated. Also on their list: "When I Fall in Love; Our Love is Here to Stay; Have Yourself a Merry Little Christmas" and "New York, New York." 7. Jack Haley and Ray Bolger, respectively immortalized as Tin Man and Scarecrow from The Wizard of Oz, come skipping onstage hand-in-hand to present the Oscar for Costume Design. 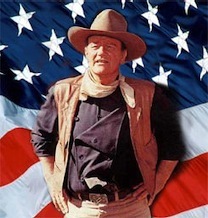 Haley dies less than two months after the April 9th telecast; Bolger passes away in 1987. 6. Francis Ford Coppola joins Ali MacGraw onstage to present a best director Oscar that would go to Michael Cimino for The Deer Hunter. But Coppola can't seem to stop itching his scruffy beard and rubbing his nose during a filibuster that leaves MacGraw looking visibly uncomfortable. Discoursing on "digital electronics" among other things, Coppola predicts a "communications revolution just around the corner that will make the Industrial Revolution seem like a small-town tryout." Oh shaddup. 5. 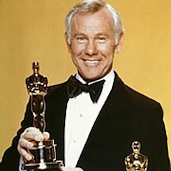 Carson, the first Oscar host to come directly from the world of television, presides for the first of five times. He gets off to a very nice start by telling the Hollywood swells, "I see a lot of new faces, especially on the old faces." But Johnny later bombs with a rather rarefied line aimed at The Swarm and Interiors: "It's been a big year for directors named Allen. Irwin Allen gave us a movie about bees and Woody Allen gave us a movie about WASPS." Crash, burn, move on. 4. "I'll lay eight to five that only two of you were looking at me," a leering Dean Martin cracks before taking a few southward looks at co-presenter Raquel Welch in a deep-plunge gown. Best original score winner Giorgio Moroder, for Midnight Express, gives Dino another opening when he says, "This is my first score." "This is your first score?" Martin riffs while a clearly miffed Welch says, "This is getting very dicey." Carson later adds to the boys locker room ambience by ad libbing, "Raquel, that's a lovely outfit, although I don't believe you'll be invited to dinner by the Ayatollah Khomeini." 3. Shirley MacLaine and Richard Dreyfuss are the presenters of the best actress Oscar, which goes to Jane Fonda for Coming Home. But MacLaine first pronounces, "I want to take this opportunity to say how proud I am of my little brother, my dear, sweet, talented brother." Pause, one-two. "Warren, Warren, Warren, just imagine what you could accomplish if you tried celibacy." The camera then cuts to a decidedly unamused Beatty seated with his then live-in lover, Diane Keaton. She's not smiling either. 2. One of the loopiest, yet transfixing acceptance speeches in all of Oscar-dom is delivered by Laurence Oliver, who receives an honorary statue from Cary Grant. Olivier, bearded for a role in Clash of the Titans, says in part: "Mr. President and governors of the Academy, committee members, fellows, my very noble and approved good masters, my colleagues, my friends, my fellow students. In the great wealth, the great firmament of your nation's generosities, this particular choice may perhaps be found by future generations as a trifle eccentric. But the mere fact of it -- the prodigal, pure human kindness of it -- must be seen as a beautiful star in that firmament, which shines upon me at this moment, dazzling me a little, but filling me with warmth and the extraordinary elation, the euphoria, that happens to so many of us at the first breath of the majestic growth of a new tomorrow." Jon Voight is impressed, He's memorably caught throwing his hand to his forehead in teary-eyed, amazed appreciation after Olivier wraps up. Voight later wins the best actor Oscar for Coming Home. 1.The night's biggest guessing game is whether a near-death John Wayne will be able to present the climactic Best Picture Oscar. Looking gaunt and sounding raspy, the cancer-stricken Duke rises to the occasion and receives a tumultuous ovation. "That's just about the only medicine a fella'd ever really need," Wayne says. "Believe me when I tell you that I'm mighty pleased that I can amble down here tonight. Well, Oscar and I have something in common. Oscar first came to the Hollywood scene in 1928. So did I. We're both a little weather-beaten, but we're still here and plan to be around a whole lot longer." It matters little that Wayne mispronounces three of the best picture directors -- Michael "Chipino" (Cimino), "Warner" Beatty and Paul Mazurki (Mazursky). Cimino's film, The Deer Hunter, wins before Carson closes the show by telling Wayne that a "few friends want to say hello." A galaxy of Oscar presenters and winners then fill the stage as the closing credits roll. Wayne is last seen shaking hands with Brooke Shields. 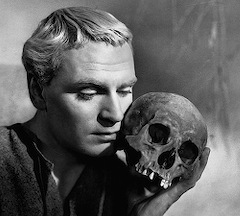 He dies just over two months later, on June 11, 1979.